Semi-Spring, originally uploaded by Amsterdamize. It was nice to take a break from unpacking today. I went to the park with some good friends, It is nice to live so close to the park where we can walk around and enjoy the sun. Even though I had a lot to do, many boxes to unpack, furniture to sell or move, and keep looking for a job; it was nice to take that break and enjoy life back in Amsterdam for a bit. Thanks for the pics Marc. Thanks for the call GabeB, and thanks Suze for the hugs. I'm so happy to announce I have just launched a new show from XOLO.TV called CRBZ.TV. Create YouR BiZ.TV. Basically we go around filming all new web startups, but we go to the homes of those who founded it. It's gonna be very cool and I'm really excited. RSS feeds to subscribe will be coming after episode 2. Fo now, just goto CRBZ.TV and check it out. The first episode is with Felix Paterson of Plazes. Upcoming episode is with SellaBand. Birthday for Mac the XOLO alpha will launch! It's that time of year to play this awesome song from my firend Steve! Furthermore for my Birthday WE ARE LAUNCHING THE XOLO ALPHA!!! How cool is that. So here's the deal. Today we will be sending out the first 10 invites, checking the system and then follow with some more invites. It may take a week to get through our list, but we are starting. What a great birthday present that is. If you haven't sigend up to be a tester you can still do that at www.xolo.tv still, but you have to be fast. For those who are wondering what I'm doing for my birthday, I will be at the Holland New festival every evening from now until friday. Friday there is a cool party, so come by and have a drink with me. It's a great day so far!!!! i cdnuolt blveiee taht I cluod aulaclty uesdnatnrd waht I was rdanieg. The phaonmneal pweor of the hmuan mnid, aoccdrnig to a rscheearch at Cmabrigde Uinervtisy, it dseno't mtaetr in waht oerdr the ltteres in a wrod are, the olny iproamtnt tihng is taht the frsit and lsat ltteer be in the rghit pclae. The rset can be a taotl mses and you can sitll raed it whotuit a pboerlm. Tihs is bcuseae the huamn mnid deos not raed ervey lteter by istlef, but the wrod as a wlohe. Azanmig huh? Yaeh, and I awlyas tghuhot slpeling was ipmorantt! 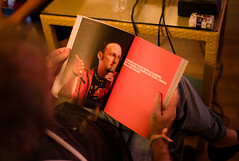 I made the DLD book this year. How cool is that! Thanks to Guido for making this picture.